A CPL(H) is effectively a license to fly helicopters commercially, i.e. charge passengers and earn a living from the flying that you do. There are obviously various licences etc that you or your operation will need as well as your CPL(H). This gives you the opportunity for Helicopter pilot jobs in South Africa and abroad. Our approach to CPL Helicopter training is career orientated. Obviously there are various ratings that you can achieve within your CPL(H) some of which are advisable to a potential career pilot, others would help you in the job market however they would not necessarily be required. Examples are: Instrument Rating, Turbine Rating etc. We can discuss this with you and tailor a commercial package to suite your career ambitions as well as your budget and time constraints. Within the CPL(H) requirements are the 100 Hrs of PIC (Pilot in Command) that needs to be completed. You will be credited for those hrs you completed as solo in your PPL(H). We offer great rates as well as fantastic scenery to enjoy those PIC hours close to the guidance of our resident instructors. If you do the entire package with us, the PPL cost will be reduced. You can take a Robinson 22 or 44 away to Gods Window, Sabi Sands, Timbavati, Pilgrims Rest, Hoedspruit or Swaziland and they are all less than an hours flight away. Maputo in Mozambique is 1 hour away in an R44 and the coastline of Mozambique is a fantastic Helicopter destination. All this gives you, as the PIC, experience in mountains (Drakensberg), High and low altitude (800ft to 7000ft in less than an hours flying), Border crossings, including flight plans, overflight clearances, customs etc. Air Traffic Controls within close vicinity to Nelspruit are Kruger international Airport (7 Mins away), Hoedspruit Military Field (30 mins), Matsapha (20 mins), Maputo (40 Mins). All the above conditions exercise your proficiency as a pilot heading towards a career in flying and build your professional confidence towards a safe confident Career Pilot. We make use of the R44 helicopter series for most of our training. The two bladed rotor system and governor throttle system are a good base for a solid pilot with good basic flight skills. 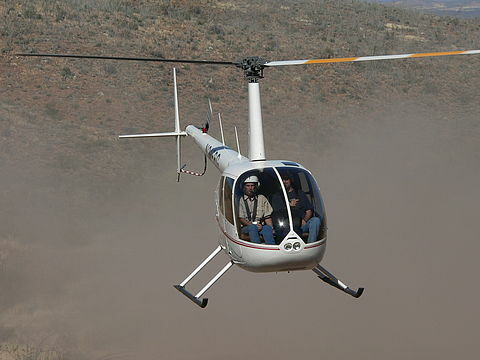 The R44 is fantastic in a commercial sense as you have extra seats and serious passenger and range capabilities. We have a few turbines in our fleet that we use for full if training as well as turbine conversions and charter so the scope to get ratings on your licence within the company is always a reality.